Renting premises is a huge expense. When hiring a traditional office space you can’t simply pay on a month-by-month basis, and then opt-out of the contract if business turns sour – you will usually be bound to a fixed term of 3-5 years. In addition you’ll have to purchase all of the necessary communications systems; furnish and decorate the interior; and establish your brand in the area. According to Skyline Offices, most businesses that rent serviced offices are looking for short-term lease agreements. Operators rent out serviced offices on a rolling basis, meaning that you will pay at the end of each month for the facilities that you’ve used. Because they have such small contract lengths, rental prices are often more expensive; however, the contracts will often come with far more services and facilities, and give your business more freedom if things don’t work out. Split testing is one of the best ways to figure out what marketing method will be the most beneficial for your business. With a serviced office you can test multiple markets in different locations without a significant long-term investment. This means that if you’re expanding and unsure which city to target next, then you could test more than one location with minimal risk, and then base your final decision on concrete results. Serviced office operators strive to maintain their staff and technology and will ensure that all of their services and facilities are of the highest quality. Buying equipment or hiring full-time staff requires large overheads. When you hire equipment or staff from a serviced office you’re not bound to any contracts and quality is guaranteed. 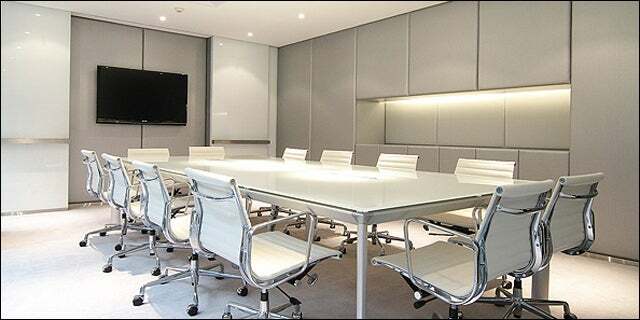 Image Caption: Conference and meeting rooms are available on a pay-as-you-use basis.